We all deal with third-party suppliers, some good, some bad, some indifferent. It is part of our ecosphere, part of who we are, part of what we do. We all need one another, we rely on one another and we ultimately create wealth for one another. And despite my years of experience, despite my wizened looks, I can sometimes be amazed. Anyone in a corporate role will be the recipient of invites to dinners, lunches, events. It is part of the same ecosystem. We want to get you into a room and talk to you, so we need something to entice you there. There are weeks when I could go without providing a meal for myself if I wanted, but I don’t. I don’t because I have better things to do and because I won’t morally take something without a genuine interest or purpose. I’m sure many of you are the same. A recent invite came in and it wasn’t appropriate to me, so I passed it on to the relevant member of my team. The next thing I know, I receive a letter from the supplier asking for feedback as they hadn’t heard from the team member that had attended the lunch and assumed they had left, they enclosed two letters that they had sent previously. The team member hadn’t left and I passed the letter to them. The simple truth is that we receive call after call, letter after letter, email after email each day from suppliers. And whilst we try to respond to everyone, it takes time. If you have a lot on, if you take holidays, sometimes these things can take a little longer than you’d like. It isn’t a sign of disrespect, but a reality of modern business. The team member in question sent an email to explain and to say that she wasn’t too pleased that the supplier had gone over her head. She explained that she was interested in the service, but that she didn’t like the pushy way in which she was being sold to. Fair enough. The company in question is called Syndicate Training, you can find their website here. Now I must say, I haven’t used their services. They may be great, they may be fantastic, I just don’t know. Nor have I been able to find anyone who could provide me with any insight. So all I can comment on is my interaction with them. 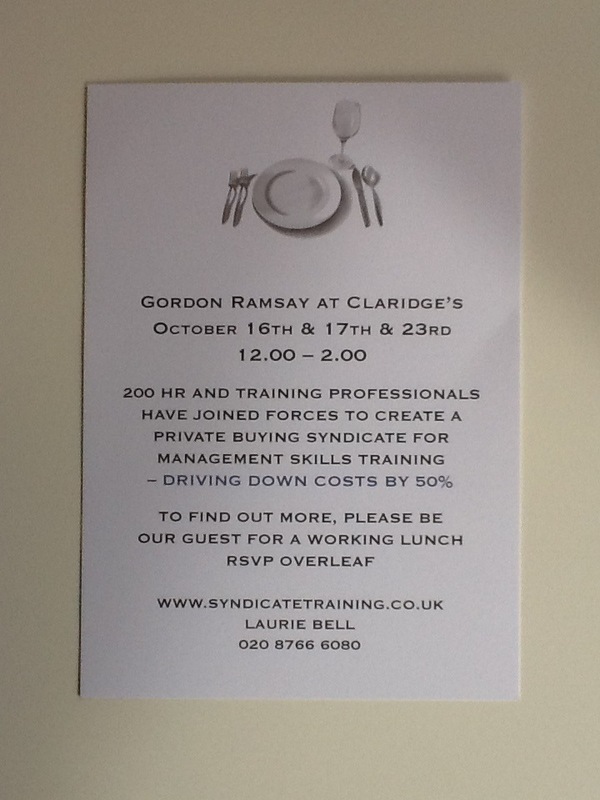 It is the view of Syndicate Members that on March 13th you were able to leave the office from 11.30 – 3.00 to attend a Gordon Ramsay lunch and that requesting your feedback either by email or a quick telephone call is not pressurising you. It is very important that professionals in HR lead from the front in matters concerning professional etiquette. I don’t think it was an unrealistic expectation for us to expect either a thank you note for the lunch or a quick call with your feedback. Please find attached a typical email response from a very busy HR Director representing her company in a professional and positive manner. Thanks for your email. I’m not really sure that it’s helpful going back and forth in this way as I am sure you, like I, have more important things to be doing. That said, I do feel that I need to mention a couple of things. [Team Member] is one of the most professional and conscientious individuals that I have worked with throughout my entire career which is why when you wrote to me, I passed the letter straight to her. If I’m honest, I find your comments about etiquette unbecoming and unnecessary and would like to think that these are said in the heat of the moment rather than being reflective of your normal business interaction. It may be that you come across people that will use your invitations just as the basis for a “free meal”, but I can assure you that we are far too busy to do that. As [Team Member] has explained, she was very pushed for time internally and then through annual leave, but had a genuine interest in your offering. It is important to me that we work with organisation that culturally fit with ours and with people that I trust and respect. We each have choices about the way in which we run our business and the tone that we want to set. On that basis, I can’t see our organisations working together either now or in the future. So I accept the last paragraph was a little pointed, but I like to think that the overall tone was fair. Syndicate Training is a Membership based organisation with a lengthy application process which has not and will not be offering a Membership to your organisation. We would however like to offer [Team Member] a free time management course from our Open Course Brochure to be utilised anytime over the next 12 months as a way of apology for assuming she had left the business. So what do I make of Syndicate Training? Well I really don’t know. They offer courses on a range of subjects, including Customer Service – Handling Customers Professionally, Emotional Intelligence Demystified, Influencing and Persuading – A Competitive Edge and, of course, Interpersonal Skills for Business. All of these seem like really relevant courses to many, many businesses……. A lot of things don’t make sense to me, if you are so selective why hold lunches to attract new business when you have never spoken to the invitee, if you aren’t interested then why push so hard for feedback and of course, why would you communicate with a potential customer who has expressed interest in your services in this way? I’m sure that they are a highly reputable company that offer a fantastic service. I’m sure that this is a blip. I’m sure that this is just me being unreasonable. I’m also sure that I will never, as long as I live and breathe, be working with Syndicate Training. Other than that, the whole thing has completely befuddled me. As for you guys, well, I’ll leave you to make up your own minds up. Guess what we received this week……is this Ms. Bell trying to make friends??? A truly fine wine of a tale. With each reading it blossoms further. Sticking this on the Stop Doing Dumb Things page, thanks for sharing. As soon as you said ‘Syndicate Training’ I sighed. I’ve used them before, and know of them. They certainly have an interesting offering. They’ve created a different way of being a training supplier. Basically you, Company X, pay a subscription, and the upshot is you get cheaper training than you would normally pay. So a 3 day leadership course will cost about 40% cheaper than the likes of Reed Learning or Hemsley Fraser. They also, almost exclusively, only use associates to deliver their training. So they’re like this middle man company. I went on one of their Time Management sessions many years ago. It was interesting. Since then I’ve seen them at HRD most years, and have certainly not done a lot of new developments in that time that make them any more interesting to me. Their method and approach will work for some companies. I’m with you on this, I’m just not interested in their offering, because they’ve just not got a great offering. It’s an interesting offering, but there are better ones in the market. Thanks for your comments Sukh. As I say, I don’t know these guys on a delivery basis. Hi Neil, than you for sharing your story and brightening my day at 0902. I am always fascinated with the reponses I get from others, especially when they seem to go against what I perceive an individual or organisation does or stands for. It will also be interesting to see what response the blog creates. Glad to have brightened your day! I am no sales expert myself, but we are a supplier to the industry and I am gaining experience and knowledge in the area. It seems these guys are confusing the sales cycle and the buying cycle. The sales cycle is internal to the supplier, but it needs to respect and be designed around the buying cycle, and the buyer needs to have of control. That was just the initial problem, before it all went a bit mad. It’s amazing how quickly they seem to have thrown the toys out of the pram. How was that ever going to help them? Incidents like these erode trust between suppliers and buyers and make it more difficult for both parties to come together and create value. Absolutely, we need one another…. Absolutely staggered…….but very amused as well. Thanks for sharing has made what was already a good day even better !! Glad your day was a good one! Did you end the contract when you joined previous co, Jose? I inherited them there and had a couple of pleasurable years with them. They were probably not the best offering out there but overall they did seem to offer value for money in those days (2002ish). I always worked directly with our account manager and had a good relationship with him. Seems from Neil’s experience things have changed. I am astounded by their responses but think Neil, you got the last laugh. Briliant! Interesting to hear that it wasn’t just me! This unfortunate style of communication is an illustration of the arrogance that emanates from those who are certain that theirs is “the way”. If value just = cheaper, then I am sure that these types of organisations are a good deal. Sighs. Arrogance is certainly the feeling that I got…. As a supplier myself business etiquette is a real bugbear for me. It is rather saddening at times how general polite behaviour is swept under the carpet in a professional context. At the start of the post I thought I may end up having a level of sympathy for the supplier, however, their petulant response is inexcusable. Regardless of what they have perceived as poor etiquette, to go to the lengths of including an email from another party and a rather tongue in cheek offer of a time management course is farcical. If you are going to complain about business etiquette at least have the good grace to show it yourself! On the other hand, without knowing the full details and largely playing Devil’s advocate, if they have been entertained with what may have been a rather nice lunch, a brief note of thanks at the end of the day would not be uncalled for. Ed, your challenge is a really fair one and yes I would agree with you. That said, if I held a party and my friends didn’t send me a thank you card, I’m not sure I’d go about insulting them!! Now that would be a course I would buy in to! Business must be really good for them if they can afford to strike a match against a bridge so carelessly. Hello Neil. This almost rendered me speechless, but not quite!! I wonder if the sender of these emails would have said quite as much to your face! Your response to them, however, was great. I also love the fact that they offer Interpersonal Skills for Business training – I’d love to see the trainer in action!! Neil, great blog. It sounds to me like they’re desperate for business and forgot to leave their “Child” (transactional analysis) in the car before they stepped into the office. Or, more simply, they just don’t realise that arguing with a client/prospect means they’ll always come second! I love a bit of transactional analysis…. I agree with Ed Scrivener’s comments, by the end of the blog I had lost pretty much all sympathy for Syndicate Training. That said, as the owner of a business that entertains as part of our new business development programme, I so expect an email thank you at the very least the following day. We are after all living in the age of smart phones and 24-hour communications access. Jake, thanks for your comment and I do agree to an extent…..but then they were thanked at the end of the session. Since the tone came from more than one person I would guess that this is somewhat institutional rather than just an isolated person having a bad day or a slight personality malfunction. It is an interesting gambit, and frankly I would have thought that shaming people as a sales technique comes with certain risks, but evidently they want to punt exclusivity as their thing, and make a public show of kicking out firms that don’t meet their requirements. This runs in a similar vein to a chef I once knew that would storm out of the kitchen and throw patrons out if they ordered their steak well-done. It was entertaining and did attract a particular clientele, but I am not sure it was a very reliable business model since the restaurant closed a year or so later. Thanks for the comment Matthew. I remember a comedy with Lenny Henry called Chef where he used to do a similar thing! Really good post and what a clearly dumb thing to do to a potential customer. In relation to Ed and Jake’s comments, I am assuming the person who attended the free lunch said thank you in person. Why is there an expectation that a follow up email should take place. Is one thank you not enough? Without being facetious, I would say that it is just common courtesy. It doesn’t take 30 seconds to compose an email to say thanks again, which I would consider both polite and professional. For any event I run I do not expect such notes, I just hope for them. For all we know the employee in question may well have done this, but the training company has in this instance perceived a lack of etiquette, whether that is actually the case or just sour grapes over a failed sales attempt remains to be seen. None of which excuses their behaviour I hasten to add! Yes they did…..I’m in mixed minds about this one. yes. and yes. i hate this and it happens all too much. and thanks for pulling the curtain back as only you can do. i once had a third party that was trying to make inroads go as far as to send out a meeting invite to people on my team suggesting that I thought it was a good idea for us all to get together – she set up a time and conference call number and all. I never once gave her the go ahead to do so. It infuriated me. Interestingly enough, I published a blog post yesterday about vendor and PR Firm antics. Here’s the link – which I share not out of self-promotion, but merely to keep this good conversation going. Thanks, Neil! Share away Charlie…..you’re always welcome here. Oh my. Just goes to show you can be crap and still survive. I also know these people. They were exhibiting at HRD last year – I seem to recall a bare stand – no branding, nothing, Just piles of leaflets on the floor and two people standing there with miserable faces. Never once looking you in the eye, just at your badge and asking “Delegate or Exhibitor?” They didn’t wait for a response unless they couldn’t see your badge. If you were an exhibitor then you didn’t get a leaflet, if you were a delegate you had one shoved in your face – a crappy, black and white mass produced and poor bit of marketing. Seems like the culture carries through to their face to face dealings. I think your response was spot on and their own churlish reply sums them up really. I wonder if there desperation for new business is fuelled by an inability to retain existing customers? I didn’t see them at HRD….but then again I couldn’t find my way around the exhibition at all!! Emotional Intelligence is one of their offerings ? Irony in action. On the other hand a marketing prof somewhere has a new example of what not to do to offer their class. Ha indeed….I wonder whether they get a discount on it?? Emotional Intelligence is one of the companies offerings? Hmmm….. Comment moderation kicks in!! Sorry. Hi Neil – as you know I read this earlier today and wanted to add my comment (we all like our blog comments increasing!). I’m seeing more of this bullying style of sales in the market and often get asked for advice by very small businesses on how to respond once the initial polite decline leads to a bullying / guilt tactic. There is no room for this in any business environment. If someone is generous enough to accept a business lunch invitation from me then I will use that time to discuss everything I wish to discuss with them. That’s the whole point and my invitee will be aware of this! This is almost Mafia like; you’ve accepted a gift from me so now you owe me. Am I going to sleep with the fishes??? Holy smokes. Neil, this is insane. Oo. I’ve got a stone to throw too. how good WAS that lunch? I don’t know I didn’t go! You may need body armour if you take up that position though…. Oh. My. God. My response? Your last para wasn’t as pointed as it might have been. Words kind of fail me. Thanks for posting. Makes me feel a WHOLE lot better about fuchsia blue’s rather non-pushy practice…. wow. In nearly twenty years of being in the profession, this is the first time I’ve come across something like this…..
LOL got an invite from them at least twice a month. They probably have to do that to keep the flow of new members. Their first response seems as the main source of the disaster. The last one tried to be a quick fix but offering “time management” course feels little sarcastic. After your blog post I am wondering who is the last one to laugh though. I work for one of the training companies mentioned in one of the replies to your blog, I really hope we are never tarnished with the same brush and I beleive we are very professional and would never, ever treat our potential or exisitng clients in this way. We have regular calls from a lady at ST who likes to terrorise our staff by pretending to be an interested customer called ‘Sarah’ and then argues continuously in an attempt to make us lose our cool so we’ll say something terrible and then threatens to quote us in her blog! This is far from professional & not something we would ever consider doing to one of our competitors. If anyone has a link to the ST blog, I’d be very interested in taking a look. Good on you for exposing them!